The growth in demand for single malt Scotch whisky boosted the value of exports in the first half of this year, according to new figures. However, the number of bottles exported between January and June was down. Value rose by 3.4% to £1.78bn, but volume fell by 2.2% to reach 528m bottles. 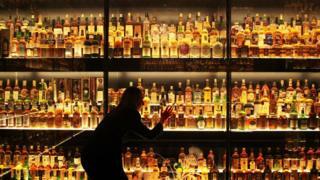 That continues a trend towards consumers choosing premium brands of Scotch whisky and cheaper blends losing sales. Single malts – with brands including Glenfiddich, Glenlivet, Jura and Macallan – typically sell for more than twice the price of a standard bottle of blended whisky. The figures from HM Revenue and Customs have been analysed by the Scotch Whisky Association (SWA). The growth in single malts has been particularly strong in the USA, with the value of shipments up 14% from January to June, reaching £123m. The US remains the biggest market by value, with total exports up nearly 9% compared with the first half of 2016, to reach £388m. Worldwide, single malt exports were up 7% to £479m. Other markets which have shown rapid growth in recent years have suffered from economic downturn. Exports to Brazil were down 20%, reaching £22m, and exports to Venezuela have weakened by even more. The European Union was the biggest single market for exports, with nearly a third of the total value, at £559m. France remains the biggest market by volume, though that fell by nearly 7%. Latvia and Italy saw particularly strong growth, while shipments to Spain were down. China had seen growth in the market earlier in the decade, but that fell sharply after official disapproval was voiced of extravagant hospitality. It has returned to growth, up 45% in exports shipped, to reach £27m. That does not include some whisky shipped to Asian countries through Singapore. As a distribution hub, volumes shipped to the island nation was up 13% to £112m, and volume up 6% to nearly 20m bottles. Japan accounts for exports worth £43m, rising 19% on the first half of 2016. Karen Betts, who became chief executive of the SWA earlier this year, said: “More and more consumers around the world are seeking out the fabulous range of single malts. “It is good to see demand for Scotch increasing in a diverse range of mature and emerging markets around the world. “But the figures mask more concerning underlying trends. The value of exports is up but the volume is down. The SWA has been campaigning for a cut in UK whisky duty in next month’s Westminster budget. The UK market accounts for about 7% of total whisky sales, and is not included in the export statistics. What happens to Mexicans returned from US?